“Who is this?” Boaz owned the field and had hired the workers, but when he cameto see how things were going, he noticed something different. 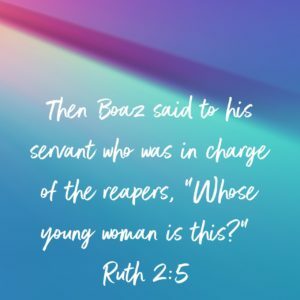 Read Ruth 2:4-5. There was someone in the field that Boaz didn’t recognize. And he’s sure he would have remembered her. He pulls his servant aside and starts to question him. Do we notice when things are different from what we expect? Do we ask about them? There are times that we see or learn things that are a bit out of the ordinary but if we don’t ask about them, we miss an opportunity. God brings interesting and unusual things across our paths every day, but if we don’t recognize them as opportunities, we will miss them. Are we looking for and ready to respond to the opportunities God brings our way?